Last week, I took R2 out to a gaming/cosplay convention in Uppsala, Birdie Expo! Birdie is also one of very gracious sponsors of the VERY nice R2 Builders backdrop we (now) have! Anyway, day 1 went by well, I managed to get some time in hooking up a servo, rerouting some cables (the quick and dirty version) and doing some code on both my receiver and the new arduino I placed inside R2. Since I was doing most of this on the fly, with a lot less tools that I usually use, the result was… well .. let’s call it “less than optimal”. Sure, I got R2 working GREAT with both the new code and the new panel and some of the extra tidbits in it (still not finished with the code, but that will be done at a later time), but .. the results are quite horrible. 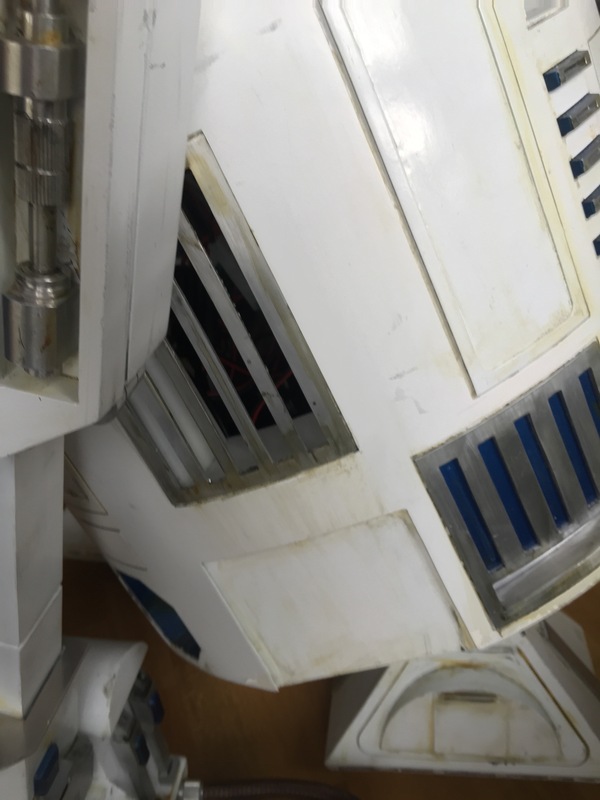 The insides of my R2 body now look like this! The extra amp, speakers, arduino and servo, without any properly done cabling at all, has turned my once so tidy R2 inside to a gigantic web! So what was the results? .. well … this! So, end user result is great, and I’m really happy. It is also the FIRST motorized servo in R2 I’ve done code for, so it marked a milestone! 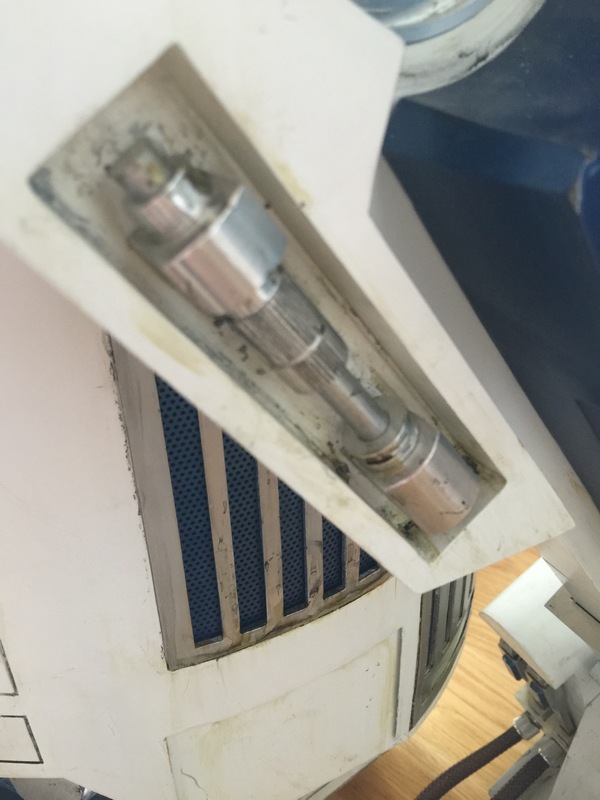 For well over a year, I’ve had servos in the dome hooked up with no place to go. Now, this will change..
Second day of the Expo started out great. I thought I’d get some time doing some tweaks in the control board when times were slow, but after a quick update, something went terribly, TERRIBLY wrong! R2 started jerking, moving by himself and seemed really weird! A little debugging told me that the communication between the bluetooth wireless Wii Nunchuck I was using, and my controller board had gone bananas. 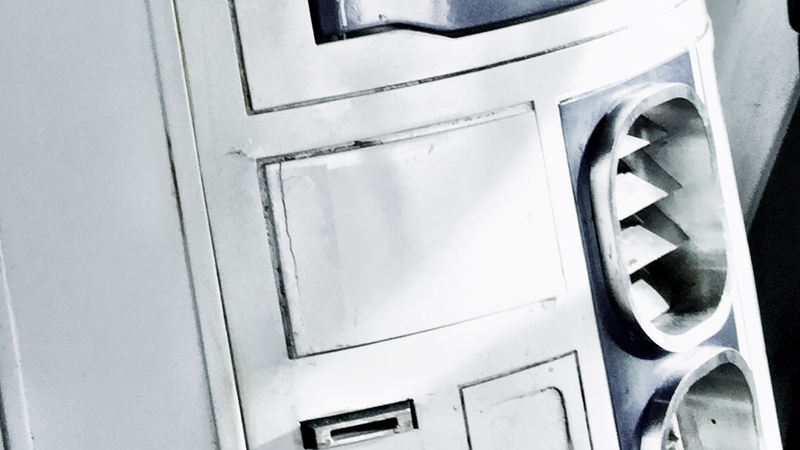 Instead of receiving real world values, it started receiving random signals. Turns out that the old libraries used (third party) had not been upgraded in the past 3.5 years, and the later versions of arduino seemed to rupture something. (I did try and reinstall an old version to no avail). So, I had to sit down and focus and see if I could fix the issue. It ended up with me programming an arduino library for the nunchuck myself from scratch. I had no idea how or what to do when starting out. About two hours later, R2 is back and moving again! PHEW! Good thing though, is that now I can throw out the buggy code, and maybe even get more third party nunchucks working with better resolution! Back at home after the ordeal, I’ve spent a few evenings looking in to the updated controller code, and will soon move over to the whole new branch of code I’ve written and improved upon from the original R-Series code to various contributions form other people. Not wanting to sit and just do coding, I decided to get the hooked up servos in the dome moving. I decided to not use the small Adafruit breakout board for 16 servos that I had, mostly because I cannot detach the servos at will, like I can with normal Arduino coding. Said and done, I found a Servo shield at a local hobby place, bought it, took it home, only to realize that it was the shield version of the same Adafruit PWM board. Now, that board could work great, if only I knew how to detach a servo in it, and unfortunately I don’t. Instead, I purchased an empty shield and did some soldering. An hour or so later it was time to make the cables for it (which is a really fidgety job that takes way longer than people think, cutting, peeling, crimping, removing bad crimps, peeling, crimping again, realize it is not sitting tight, remove the second bad crimp and make a third one… and so on. Once that was in the head, I started hooking things up and got really weird results from the first servo. First servo alone. It wasn’t supposed to be doing anything… yet. I removed all code that would make any servo move, and still I got really weird results from a servo. Why? what’s going on? I pulled everything out again and started writing from scratch… turns out that after a bit of googling on what I found, pins 0 and 1 on the Arduino are earmarked for Serial connection, so you have to disable the serial in order for them to work as a normal pin…. Once I found that out, I managed to get a sketch going, and started setting max and min values on the servos. 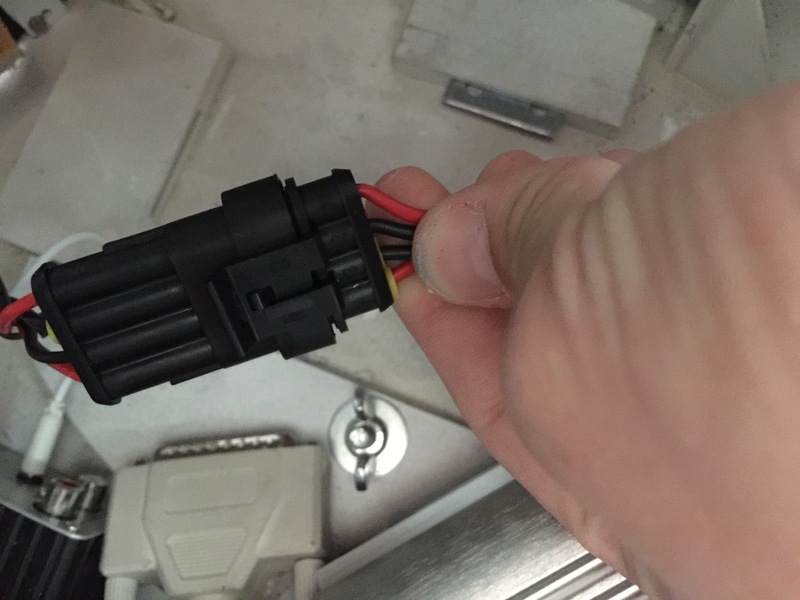 Not having a lot of time, I did not have time to investigate why one of the servos are not moving. The pie panel not moving in the video is not moving since the nut and bolt that was holding the piano wire that connects to the servo, fell out. Something to fix later on when I investigate why my servo on the 3rd panel doesn’t work. Here’s a quick video I took after setting the max and min values. I’m not done yet by a long shot, but at least it is a start! 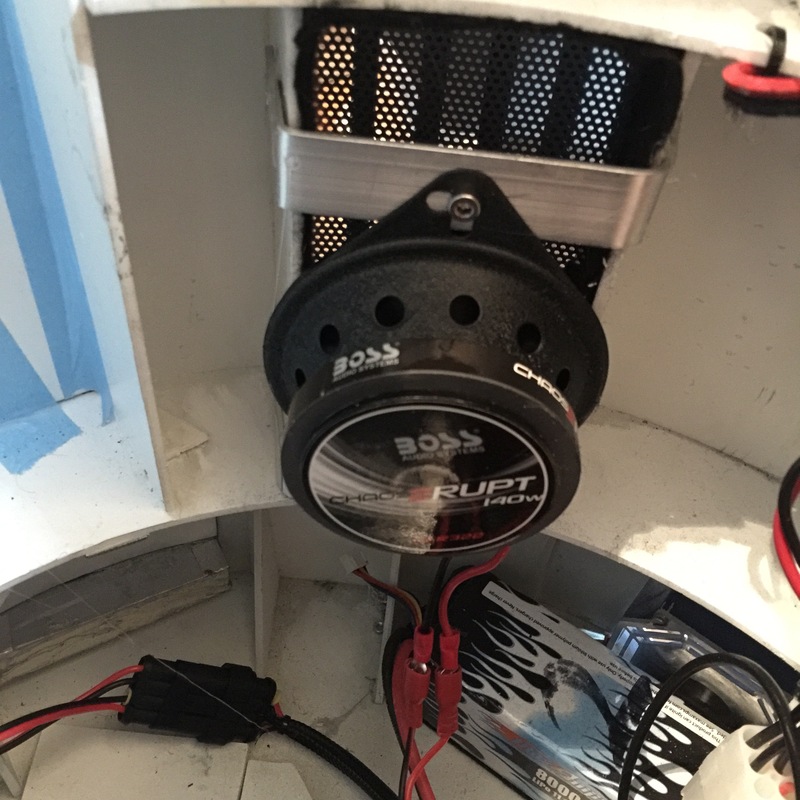 I drilled the metal brackets holding the new speakers, coated the inside of the “pockets” where the speakers will reside with black felt..
.. and hot glued the perforated aluminium backplates in place. I might need a little more hot glue, but that is a minor issue, as I can always add that later on. Finally I decided to hot glue the metal brackets in place as well, as I really don’t need to bolt them in to place at this point just yet. It is difficult to drill through inside the body, and the industrial strength hot glue is good enough to hold them in place. If not, I’ll just gently pry them lose and replace the hot glue with E-6000 once I get a new fresh tube. 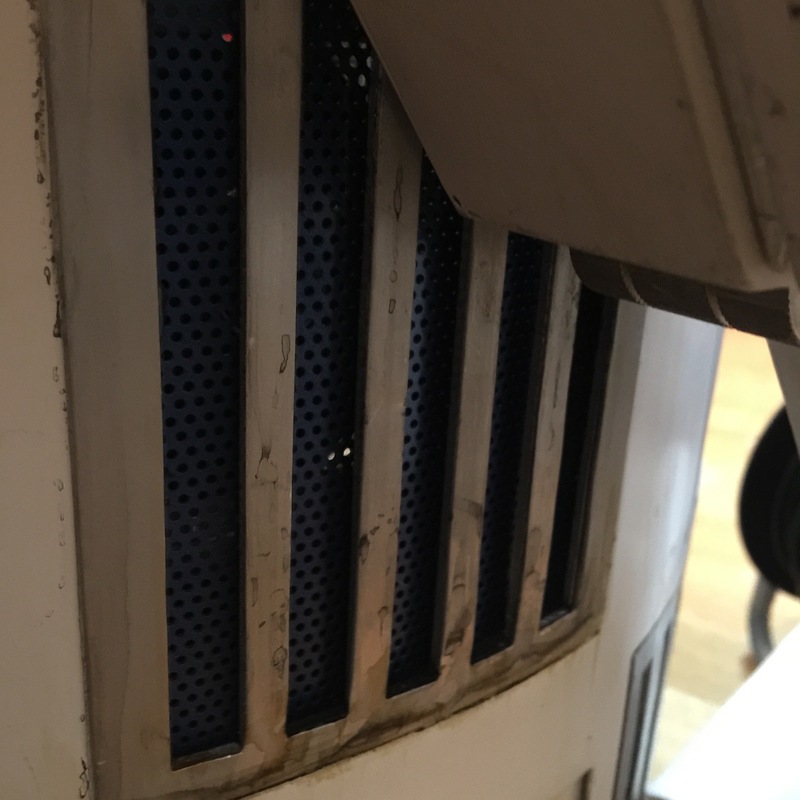 After trying to fasten the missing hatch in the front, I needed to adjust the hinge somewhat, si I snapped it lose (it was only superglued into place after all), tampered with it slightly, and glued it back in place with the last of my E-6000. That should hold it firmly in place! Once the tests were done, I also had to try out the freshly made driving sound. I recoded this over Christmas at work from one of my colleagues electrical re-positionable desk and worked with the sound file late last night. 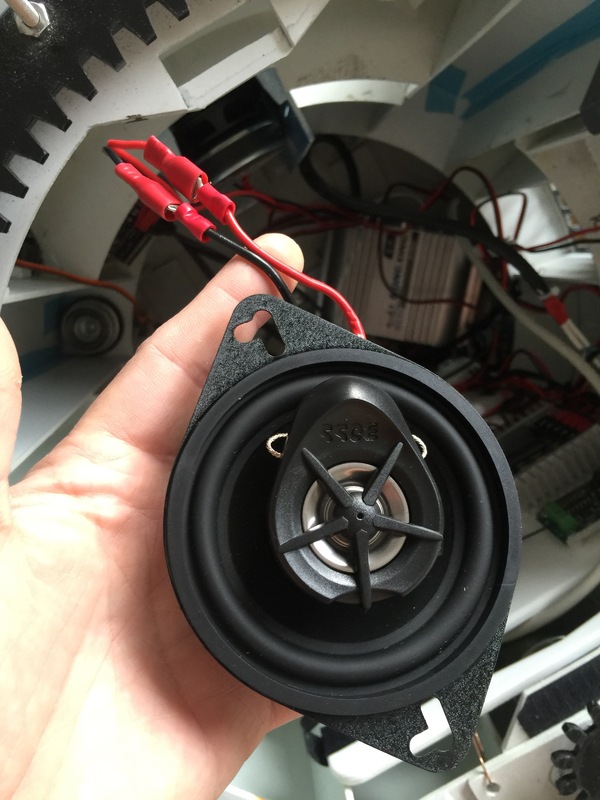 By micke|2016-12-06T00:00:19+00:00May 12th, 2015|R2-D2|Comments Off on Side speaker mount done! 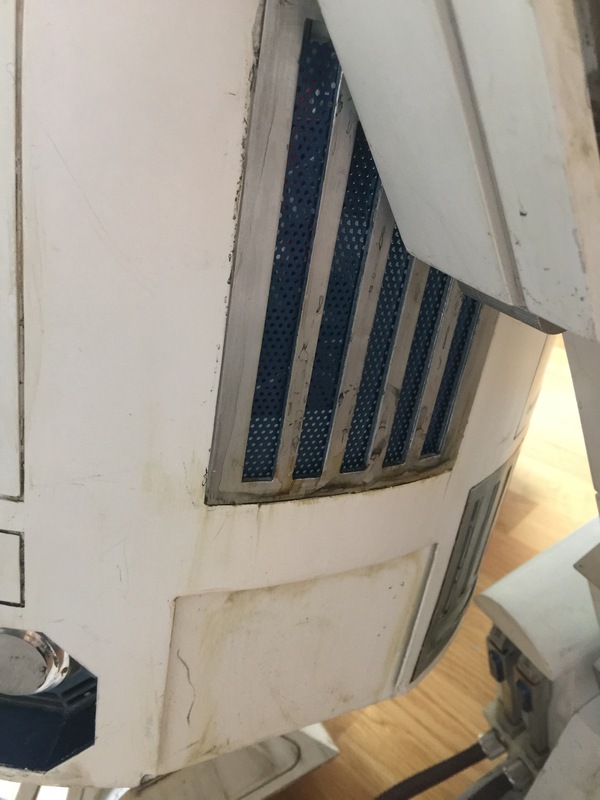 I took R2 out a little while ago, since there was a huge Star Wars fan at work who was leaving the company, and I decided to bring R2 and make his day. Fortunately my lightning fast reaction managed to save the droid before the front hit the mix of gravel and tarmac, but not without battle damage. 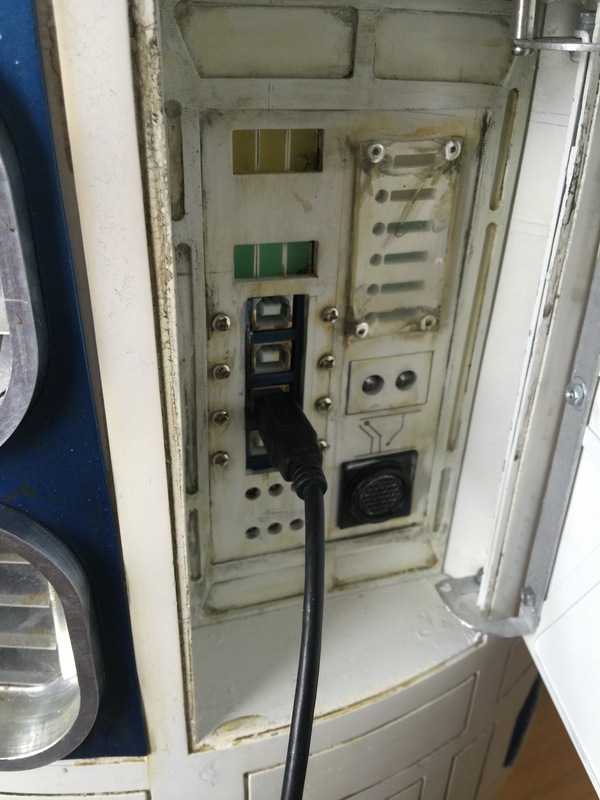 The tiny door around the charging bay panel took a hit. The hinge was bent, and the door was broken off in two places. I was lucky I found all three parts of the hatch to begin with! 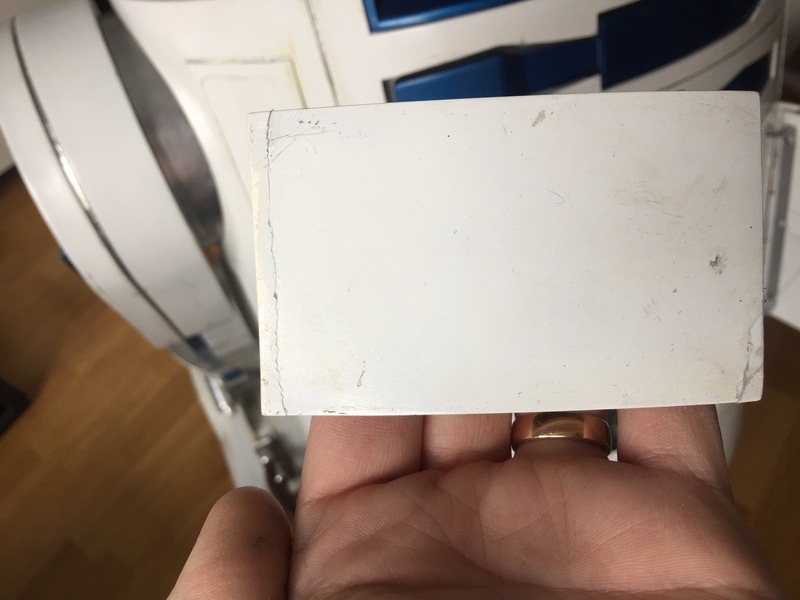 I got through the day (and a subsequent official Disney / LFL event) by adding a bit of scotch tape… first to hold the panel together, second to hold it in place. Yesterday was the day to start fixing that, and also to make some time for some small upgrades! 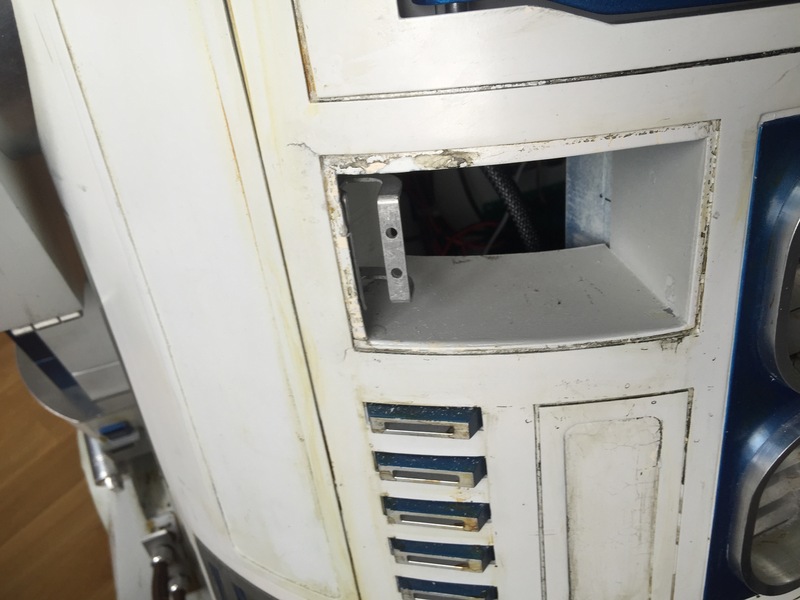 So, for starters, there’s a gaping hole in the front of my droid. New hinge is not yet mounted. At least I’ve got a straight, working hinge.. The hatch has been glued together with superglue. Technically, I could build a new one, but the painting is a bit of a hassle when you live in an apartment, and getting the weathering to match might be even more so. Besides, the visible cracks can still be extra weathering and battle damage. I have even considered adding a darker wash to the crack to make it even more visible. I have also prepped a second amplifier, that is supposed to drive two speakers that will be sitting right inside my side vents. 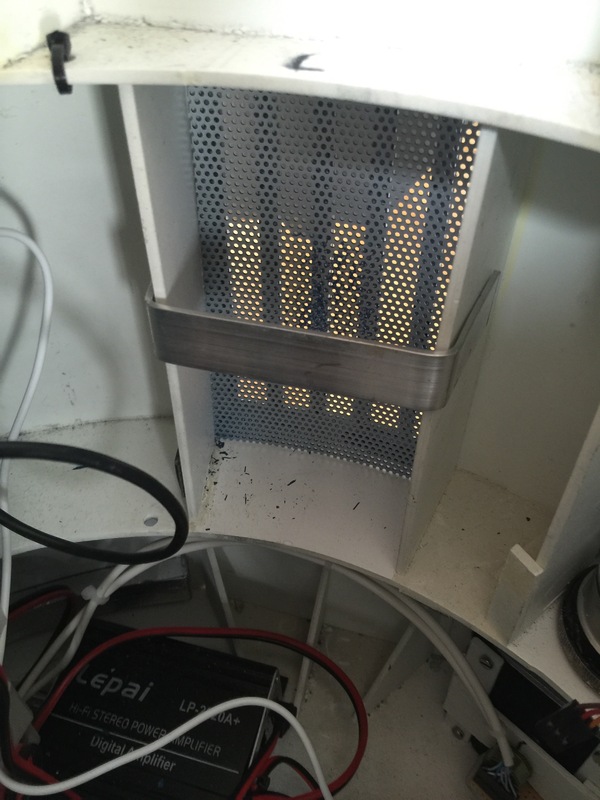 So, since I was in doing things, I pried lose the back plates from my old side vents… and let some air in. But, with an added layer of black felt behind it, it should be invisible. I still need to add a bit of weathering to the back plate though. 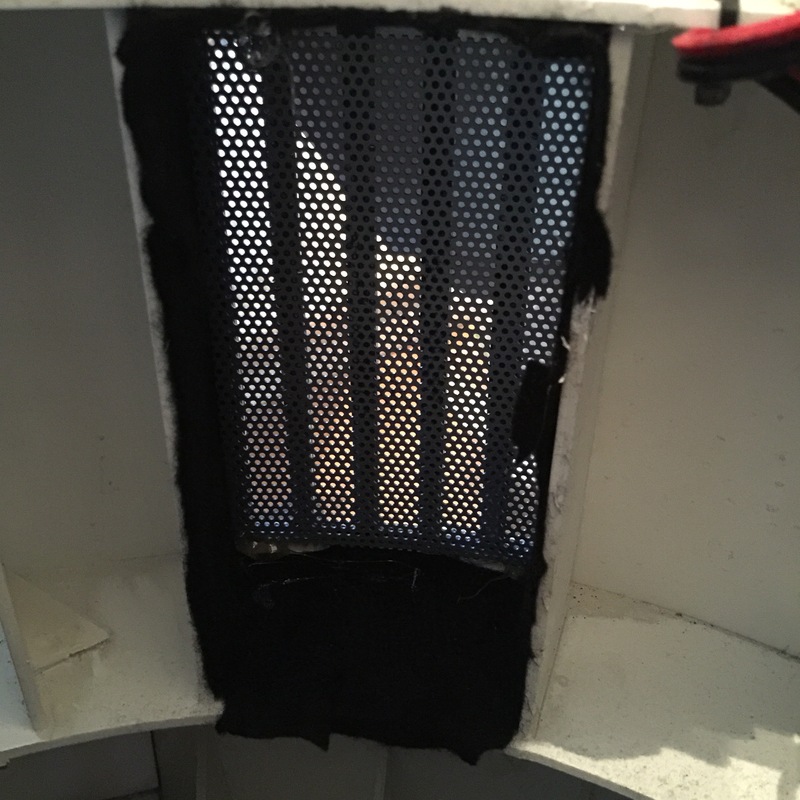 At the moment, the idea is to mount speakers from within on metal brackets, and possible cover the white frame parts in black felt, and surround the speaker with black felt as well, creating a totally black trap behind the vent. It will create a little bit of depth, but also not showing anything of the frame behind the perforated plate. 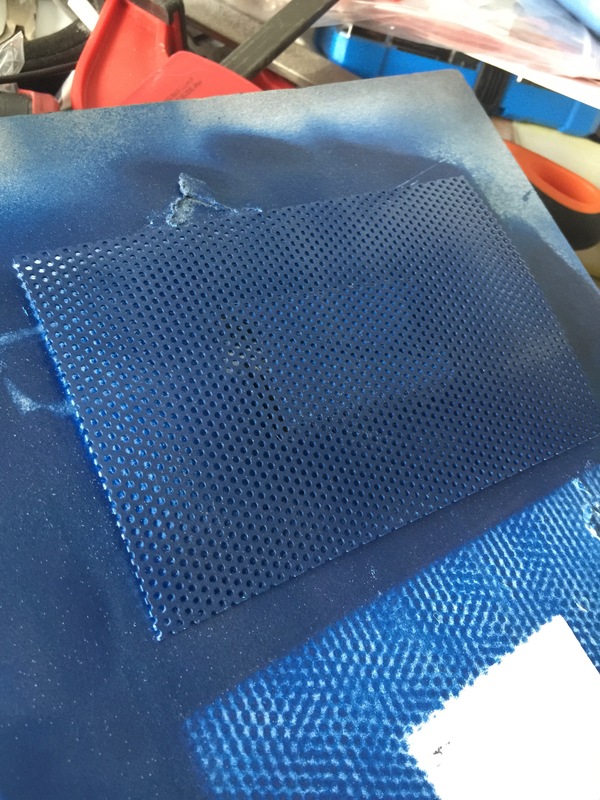 The plate needs to be perforated in order to let the sound waves through properly, of course. I also soldered the cables in place needed for the new amp and pulled out a power cord for it. Done. I still need to route out the second volume knob like I did on the first droid, but I will require a little help with that this time. I also took out my Rogue Robotics mp3 shield, which is really old and have no updated libraries for my arduino since 2012, and resoldered the 3,5 mm socket back in place, it had broken lose somewhere. It works now, but it sounds like there is no volume coming from it. Fortunately, it is no problem for my amplifier! 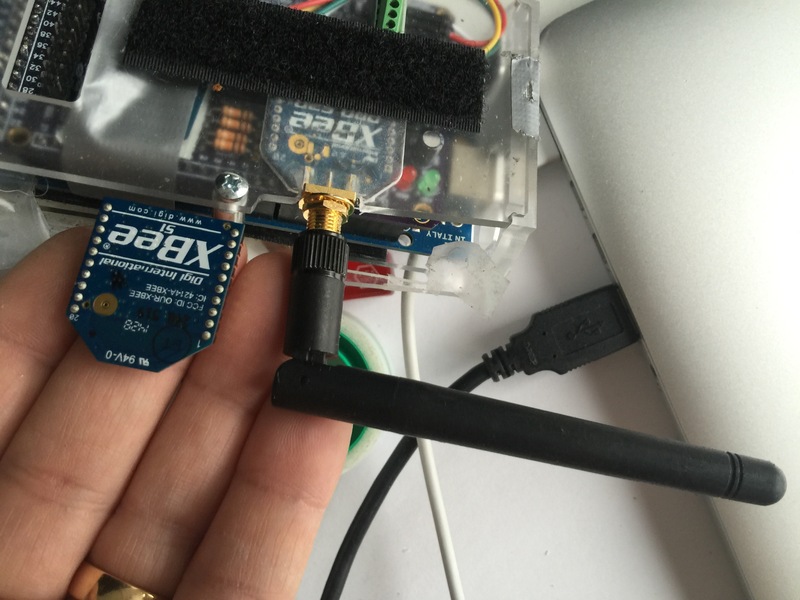 … and it is working a lot better. STill lots of things to mount and tweak. That’s it for now… more shortly!